Gout is an extremely painful type of arthritis in which sharp, needle-like crystalline deposits of uric acid form within the joints. Although it typically strikes the base of the big toe nocturnally (up to 60% of initial attacks occur here) , it can occur in any joint. These painful attacks can last for days or even weeks before going away for an indefinite amount of time. It’s not uncommon for a gout patient to go years without another attack. An estimated 840 out of 100,000 people, usually between the ages of 30 and 50, get gout. It is 20 times more common among men than women. Women rarely get gout before the onset of menopause. Some families are genetically predisposed, and African-Americans as well as individuals with poor kidney function are more likely to suffer gout attacks. According to the 2007-2008 National Health and Nutrition Examination Survey (NHANES), gout affects upwards of 3.9 percent of the American population, and hyperuricemia (an excess of uric acid in the blood, which is a precursor to gout) affect 21.5 percent. The typical western lifestyle is also blamed for the increased incidence of the disease. 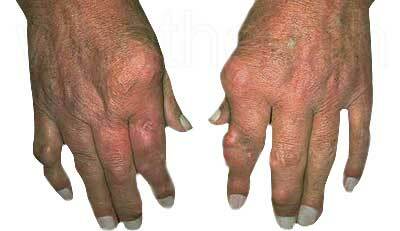 Recurrent bouts of gout can lead to “gouty arthritis,” which is a degenerative type of chronic arthritis. Some common medications, such as diuretics, may also contribute to gouty arthritis. Primary Gout is a genetic disorder of uric acid metabolism leading to high levels of serum uric acid. High serum uric acid levels cause monosodium urate crystals to precipitate out of solution into a joint, usually only one at a time, at least in the early stages of the disease. The presence of urate crystals in a joint sets off an immune response which causes the body to attack the internal components of the joint, leading to extreme pain and eventually joint destruction. Secondary Gout (10% of cases) results from catabolism secondary to leukemias and certain other cancers, or decreased excretion of uric acid due to renal failure. Uric acid rate of solubility is greatly affected by temperature, which is why the majority of cases present in a distal extremity. It is thought that the crystals also have a tendency to form on a roughened surface, such as a joint that has suffered from previous trauma, unreduced subluxation, or degeneration. More Information How Gout Develops? Gout is caused by elevated blood levels of uric acid, a waste product of the breakdown of cells and proteins. This excess can be due to an increase in uric acid production as well as the inability of the kidneys to adequately clear uric acid from the body. Certain foods, such as shellfish, and excessive consumption of alcoholic beverages may increase uric acid levels and precipitate gout attacks. Obesity, hypertension, diabetes, and medications can also increase uric acid levels. With time, the elevated levels of uric acid in the blood may form needle-like crystals in the joints, leading to acute and very painful gout attacks. Uric acid may also collect under the skin, which is known as tophi or in the urinary tract as kidney stones. 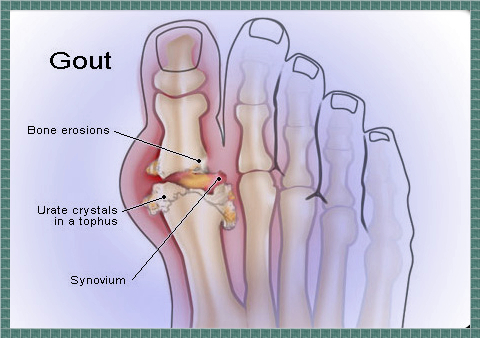 The most common symptoms of gout are insidious episodes of extreme pain without any trauma, inflammation, swelling (edema), tenderness, warmth and redness in the affected distal joint or extremity... usually in the big toe (the first metatarsophalangeal joint) which accounts of up to 60% of initial attacks. Touching or moving the affected joint is intensely painful, and patients often say it hurts to have as little as a bed sheet over the affected joint. The pain may be accompanied by a mild fever. Gout develops quickly, and although it typically occurs in only one joint at a time, on rare occasions symptoms may develop in two or three joints simultaneously. In most cases, however, if these symptoms occur in joints throughout the body, the condition is probably not gout. History may also reveal a high-purine diet; an excessive intake of alcohol (particularly beer); the use of diuretics; the use of aspirin; the low intake of water; a very reduced caloric intake (leading to catabolism); or a family history of gout, diabetes, hypertension and obesity are some pre-disposing factors. Signs include tophi deposits at the helix of the ears and high serum uric acid levels, not necessarily above the high range listed on a lab report. Levels over 6 mg/dL may be symptomatic. How does chiropractic help gout? The most common medical approach to treating gout is to prescribe medications, anti-inflammatory drugs and steroids to manage pain. While this may work on a short-term basis, it may also cause unwanted drug-related side effects. In contrast, the chiropractic treatment of gout usually involves a combination of advice about diet and lifestyle changes along with chiropractic adjustment/manipulation to reduce pain and address the cause of the disease without the use of drugs. We know the nervous system (brain, spinal cord, and nerves) is the master control system of the body. It controls every organ, muscle, gland, etc. at all times. If for example your kidneys don`t receive the right nerve supply from the brain, they will not function properly anymore. This could happen due to a misaligned vertebra (Vertebral Subluxation) in the lower back. This doesn`t need to cause any pain, but over time altered neurological control to the kidneys may have an effect on the kidneys in that they may not adequately eliminate the uric acid in the body. This uric acid would then form crystals at a particular spinal segment or joint, and the symptoms of gout would set in (painful red-shiny joint). Correcting these spinal or joint misalignment problems through a chiropractic adjustment/manipulation is the job of a chiropractor. Your chiropractor will likely advise that you reduce your intake of meat and alcohol and increase your intake of foods that have been shown to lower the concentration of uric acid in the blood, such as cherries. Half a pound of cherries per day is the recommended amount to eat if you are looking to lower uric acid levels. However, you can also drink concentrated cherry juice or take cherry juice extract to achieve the same results if cherries are out of season or eating that many is not to your taste. Quercetin, a flavonoid found in such foods as apples, berries and onions, inhibits the production of uric acid, so your chiropractor may also suggest that you include more of these in your diet as well. Herbs that support kidney function (like couch grass) may also be recommended; since they may help your kidneys work more efficiently to clear the blood of excess uric acid. Chiropractic care is an effective way to manage gout. Chiropractors are able to help relieve any subluxations (mis-aligned vertebrae pinching nerves) in your spine that may be interfering with the communication between your nervous system and brain, including body tissues. The nervous system controls all the organs of the body, including the kidneys. If the kidneys aren’t getting the proper nerve supply from the brain it will cease to work properly. In this way, specialized chiropractic techniques performed by your chiropractor can help the kidneys begin to function properly again. In addition to providing you with adjustments, Dr. Pisarek can teach you ways to manage your gout when you’re not in the office. One of the best things that a patient with gout can do is to eat a diet that’s low in purines. Another is to ensure that you’re getting enough of foods that have natural anti-inflammatory properties. Conventional medical treatments may help relieve the symptoms of gout, but they do not address the root of the problem. By strengthening structural weaknesses and addressing imbalances in the body, as natural treatments such as with chiropractic care, pain associated with gout may be alleviated permanently. The allopathic (medical) drug of choice for the treatment of gout is allopurinol. Although effective in reducing serum uric acid levels, allopurinol may precipitate over 30 adverse side effects, including abdominal pain, hepatitis, headache, kidney failure, hair loss, muscle disease and joint pain. The most common side effect is a sometimes fatal skin reaction in which one's skin peels off in sheets. The natural approach to the treatment of gout includes counseling the patient on dietary changes, with a reduction of high-purine foods, increased consumption of water (at least 64 ounces per day), along with 12-16 ounces of cherry juice per day and the elimination of alcohol, especially beer. Aspirin should be avoided, as it raises uric acid levels. Over-the-counter (OTC) medications such as Aleve may be substituted, as it lowers uric acid levels, but it can cause stomach problems. In the acute and chronic stages, laser, ultrasound, heat, gentle chiropractic manipulative therapy and gentle soft-tissue massage are beneficial. ​Click here for article "The 5 Steps to Overcoming Gout Naturally"
Essential fatty acids (salmon, tuna, flaxseed, olive oil, nuts, seeds). All of these foods are healthy ways to reduce inflammation in your body without resorting to NSAIDs. In addition to eating anti-inflammatory foods, certain lifestyle changes may be in order if you wish to reduce your gout symptoms. Managing your weight, limiting your alcohol consumption and increasing your level of exercise are all great ways to manage gout. They can also help lower your risks for developing gout in the future. What foods should be avoided? Alcohol, Anchovies, mussels, herring, sardines, scallops, meat extracts, yeast, gravies, organ meat (hearts, kidneys, liver), Goose, Pheasant and Trout. The following foods are considered high in purines as well, but may not raise the risk of gout: asparagus, spinach, cauliflower, peas, kidney and lima beans; mushrooms; cereals, breads; chicken, duck, ham, and turkey. Remember: Protein should not be totally eliminated in ones diet, even though purines are found in all protein rich foods. Click here for WebMD article: "Arthritis and Gout". If you’re struggling with gout, contact Dr. Pisarek at Advanced Healthcare. and begin feeling like royalty again.